Watching the Jacksonville Jaguars roll over the New England Patriots at home today, made me think back to the days when I was regularly covering Jacksonville Jaguar games as a freelance photographer based out of Daytona Beach, Florida. 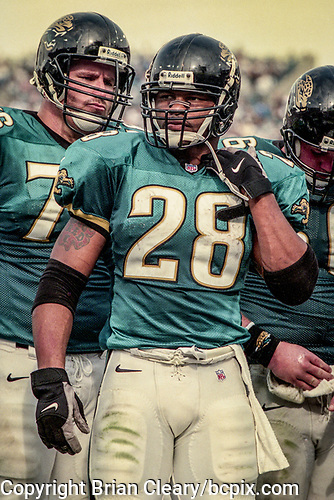 As an expansion team, playing their first season in 1995, the Jags can out of the box hot, making the playoffs in their second, third, forth, and fifth seasons, making it to the AFC Championship game in just the fifth season of their existence, meeting the Tennessee Titans at home on January 23, 2000, for a chance to advance to the Super Bowl. 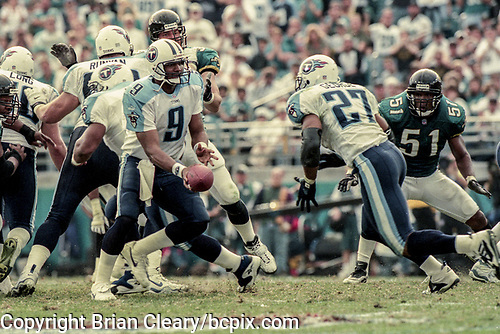 Things did not go well for the Jags, as the Jeff Fisher coached Titans, with Steve McNair at QB won the game impressively by a score of 33-14. Following the Jags' championship game appearance, the wheels came off a little with 3 straight losing season under their only head coach until that time, Tom Coughlin. Coughlin was fired, giving way to Jack Del Rio, who suffered another losing season in 2004, before returning Jacksonville to the NFL playoffs in 2005. The January 2000 contest game was the first an only Conference Championship game that I photographed and, the game was generally a grinding affair, which makes for a tough photographic day. 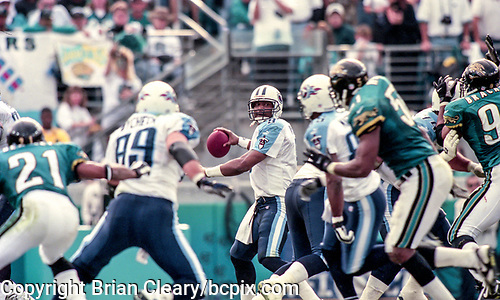 Quarterbacks Steve McNair (Tennessee) and Mark Brunell (Jacksonville) each threw one touchdown pass, with the bulk of the action coming n the ground. 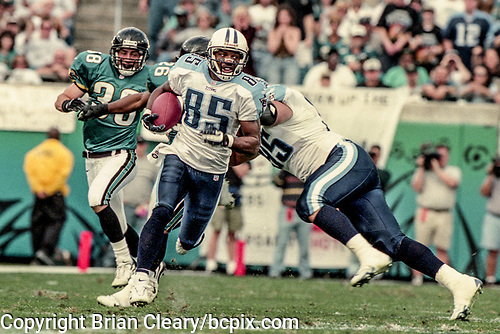 For the Titans, Eddie George and McNair combined for 175 yards rushing while Jaguar workhorse Fred Taylor rolled for 110 yards of his own. McNair ran in two TD's and Derrick Mason provided the scoring and photographic highlight of the day with his 80 yard kickoff return for a touchdown. One of the great things about photographing football is that you never know what you will get when you take up your position on the sideline at the start of each game, and one of the great challenges is trying to provide coverage of whatever happens in the course of the game as well as trying to produce interesting images when very little actually happens! While the majority of my photographic career has been spent standing trackside at motorsport events, I'll never turn down a chance to snap a few football photos!